Alcatel OneTouch, known for its mobile phones, tablets and wearable devices, has developed a loyal following with its consistently innovative and high quality products. With Big Apple Buddy’s fast international shipping service, you can now buy from the USA Alcatel online store anytime, anywhere. 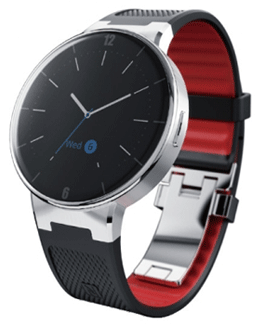 The Alcatel OneTouch Smartwatch, currently only available in the U.S., has revolutionized the collection of smart watches today. Available in two unique designs - the sporty black and red and the fancy silver metal - the Alcatel OneTouch Smartwatch molds to any style. This innovative wearable allows you to take selfies with a shake of the wrist and comes in two sizes: small/medium and medium/large. The popular Alcatel OneTouch Idol 3 Smartphone is packed with new features such as dual front-facing speakers and a very wide camera angle. Its enhanced color definition will allow you to take exceptional pictures in the sunlight. The largest gadget of the collection is the super thin and extra light Alcatel OneTouch Pop 8 Tablet. Armed with a range of colorful accessories, the Pop 8 Tablet provides plenty of opportunities for those who like to customize. Alcatel stores are located internationally, however only at the USA Alcatel Store will you find the full range of Alcatel products. Unfortunately, the USA Alcatel Store does not currently offer international shipping. Big Apple Buddy, your personal shopper, can however help you buy from from the USA Alcatel Store and ship the items to your doorstep, no matter where you are in the world. If you’re interested in buying exclusive items from the USA Alcatel Online Store, simply let us know what products you would like to order (by filling in the form below). We’ll get back to you with a free international shipping quote within 24 hours!